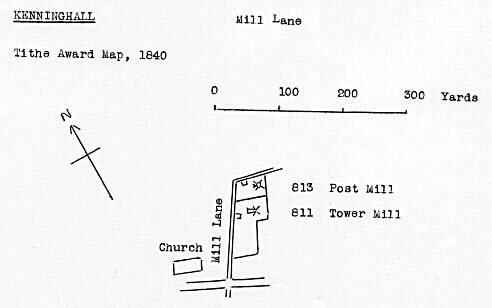 Kenninghall Mill Lane postmill is thought to have been built in 1704 and stood at Church Farm in Mill Lane just to the north of the adjacent towermill. The mill buck was set on a roundhouse and in 1844 was using one pair of common sails and one pair of patent sails. The mill was later fitted with a second pair of patent sails and the 4 double shuttered sails, each with 8 bays of 3 shutters, set on an iron windshaft, worked in a clockwise direction driving 2 pairs of 4ft. French burr stones, a flour mill and a jumper. An 8 bladed fantail was set at the bottom of the ladder leading to the porch. A bake office was also run on the premises. Will be Offered for SALE by AUCTION by T. Calver at Kenninghall sometime in the month of November next. The ESTATE comprises a comfortable Dwelling house with Baking Office adjoining, a substantial Post Windmill driving two pair of Stones, Roundhouse, Granaries, Stable, Cart Lodge, Piggery, Millyard, Garden & small Orchard of prime young & choice trees. The Land (with the sites of the Buildings) contains about half an Acre all late in the occupation of Mr. Edmund Farrow deceased. The Mill & Buildings are in excellent condition & eligibly situated for trade. Apply to Messrs. Brooke & Calver, Solrs. Kenninghall & Long Stratton. Notice to Debtors & Creditors of Mr. Edmund Farrow late of Kenninghall, Miller & Baker, deceased. Notice to Debtors & Creditors of Mr. Edmund Farrow, of Kenninghall, Miller & Baker, deceased. Via an indenture dated 27th May 1836, William Farrow, a farmer of Skelton sold the mill to James Reeve, a carpenter and joiner of Kenninghall. A capital POST WINDMILL with Roundhouse, one pair of patent & one pair of common Sails, two pairs of French Stones, Flour Mill & Jumper & all usual machinery complete & in thorough repair. A neat & commodious Dwelling house comprising four chambers, a good Cart Lodge, 2 Granaries, 2 Stables, Piggeries & other buildings, Yard, Garden & Orchard, the whole in the occupation of Mr. James Reeve, the proprietor, who would give early possession. Apply to Mr. Reeve or to Mr. Calver, Solr. Kenninghall. Particulars of Mr. Reeve or Mr. Calver, Solr. Kenninghall & the Auctioneer, Thelton near Scole..
All that old-established POST WINDMILL with roundhouse, two pairs of French stones, flour mill, jumper & other going gears; substantial & convenient tiled Dwelling House, stable, two granaries, cart-lodge & other outbuildings, well planted orchard, garden & mill yard containing altogether half an acre more or less & now in the occupation of Mr. Thomas Burrows at the annual rent of £28. Apply to J. C. . Calver, Solr. Kenninghall & the Auctioneers, Diss & Thelton near Scole..
James Reeve, a carpenter and joiner of Kenninghall had mortgaged the mill from Benjamin Hastead but defaulted with the repayments. Eventually Benjamin Hastead foreclosed and via an Award of Enfranchisement dated 15th October 1864, became the new owner of the mill. Salter & Simpson are favoured with instructions from the Executors of the late Mr. Benjamin Hastead to Sell by Auction early in July at Kenninghall Two comfortable Dwelling Houses, Cottage & Gardens & an old established four sail WINDMILL. Particulars of Mr. F. Fowell, Solr. Garboldisham & of the Auctioneers, Attleborough. The sale of the Windmill & Premises at Kenninghall in the occupation of Mr. Burroughes is POSTPONED until further notice. Helen Burroughes was visiting her grandfather, Thomas Burroughes at Kenninghall postmill and while playing in the mill yard with two other girls, she took hold of a stationery sail about four feet from the ground. The mill started off almost immediately and she was carried up about twenty feet before she fell to the ground and was killed. On Tuesday last, John Muskett, Esq. held an inquest at the White Horse Inn, in this parish on view of Helen Matilda Burroughes, a little girl aged seven years, the daughter of Mr. Burroughes, miller of this place. The deceased and two other little girls were playing in the mill yard on Monday afternoon and in the course of their play, the deceased took hold of the mill sail, which was about four feet from the ground and from her weight it is supposed and a slight breeze springing up set the mill off and the poor child was taken with the sail for about twenty feet high, when she fell to the ground and was killed. The deceased's playmates said the sail started off nearly directly she got hold of it, a gale of wind having sprung up and before Mr. Burroughes, who was in the millyard could get to the deceased she fell. The witness told deceased to leave hold of the sail and she replied, 'Let me go a little farther'. The mill was ready to start when the wind came up. Verdict, 'Accidental death'. 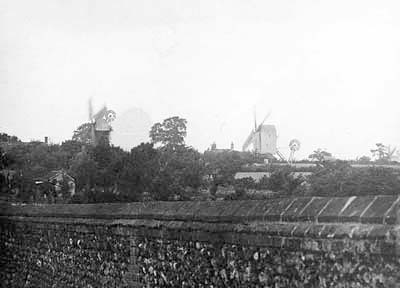 The coroner advised Mr. Burroughes not to let children play in the mill yard and cautioned the two little girls who attended the inquest as witnesses not to go near mill sails in the future. BOURROUGHES. On the 29th ult. Helena Matilda, the dearly beloved child of Barnabas and Jane Burroughes of Aslacton in this county, who was accidentally killed while on a visit to her grandfather at Kenninghall, aged 7 years and 10 months. Salter, Simpson & Sons are favoured with instructions from Mr. David Bullock, who is giving up the business, to Sell by Auction at the Royal Hotel, Attleborough on Thursday June 1st 1893 at 4 o'c in the afternoon in One Lot. A capital Four sail POST WINDMILL driving Two Pairs of 4 foot Stones, with Flour Mill, Iron Shaft, Storehouse & Granary above, Cart lodge, Stable, Harness house, Bullock Sheds & Yards & other Outbuildings. Also a comfortable Brick, Clay & Tile DWELLING HOUSE with 2 Sitting rooms, Back Kitchen, Storeroom, Cellar, 3 Bed rooms, Garden, Well & small Orchard, situate in Mill Lane & adjoining the property of Mr. Peverett & Mr. Skipper. Freehold. Tithe 1892 2s. 6d. Land Tax 15s. 9d. The above Property has been in the occupation of Mr. Bullock for many years & the Mill & House are both in good order. The Purchaser to take by Valuation the Mill Utensils & House Fixtures, a schedule of which will be produced at the Sale. Conditions ... of the Auctioneers, Attleborough & Bury St. Edmunds or of Messrs. Miller, Steven & Son, Norwich & Kenninghall, Vendor's Solicitors. Compact & Substantial DWELLING HOUSE, Windmill, Granary & Outbuildings, with Garden & small Orchard, in excellent condition near the Church. Freehold. Apply to Miller, Stevens & Son, Norwich & Kenninghall. On 30th August 1972 Horace Freestone of Hilborough wrote to Harry Apling to say that he had formerly been at Little Cressingham Mill and also Hilborough Watermill. His father Horace Freestone left Poringland High Mill and went to the Star Public House for a year before moving on to a postmill at Kenninghall, possibly Mill Lane postmill. He did not work the mill and in 1907 moved on to Little Cressingham Mill and Hilborough Watermill. KENNINGHALL Villagers have embarked on a fascinating journey through the past. A team of residents are now arranging all the historical information they have gathered into an impressive exhibition. She got together with other villagers interested in unearthing the past – and some of the secrets they uncovered were quite startling. At one time, for example, the village was regarded as a town and housed three private schools, seven pubs, four places of worship and a slaughter house. 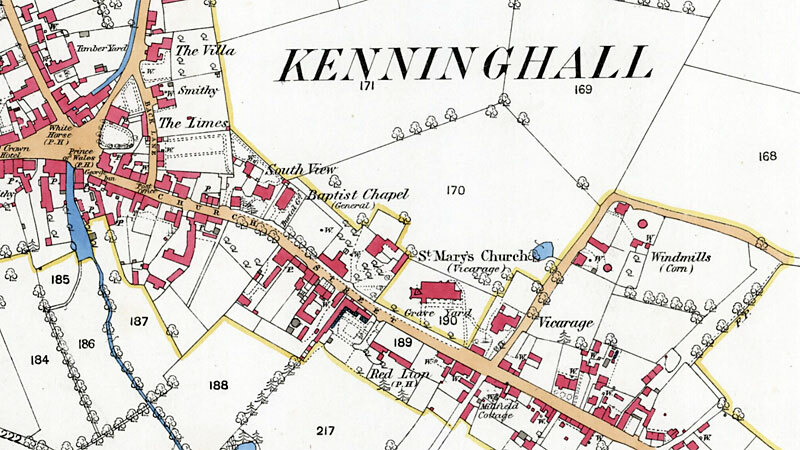 A harnessmaker, boatmaker, watchmaker and several blacksmiths all congregated in the village over the years, and although … eventually … face of Kenninghall was virtually unchanged. Mrs. Elizabeth Hayes said most of East Church Street had been shops and despite the fact that nearly all had closed down the buildings remained. Historian and village antiques dealer Mr. Tony Cardy, joining in the search for mementos of the past, found the village’s old Automobile Association sign, probably made around the time of the first world war, which shows Norwich as 19¾ miles away and Diss 8½. “I actually bought it at Fakenham auctions a few years ago and I’d really love to know which building it came from,” he said. 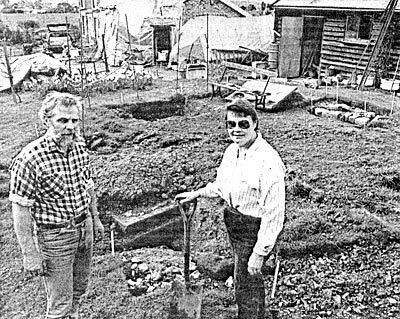 The village also once had three windmills, and Mary and Terry King are digging up the foundations of one which stood in their garden in Mill Lane. So far they have discovered the base for the four supporting pillars and a hoard of china pieces, stained glass and oddments. The mill is steeped in history. Folklore has it that a young girl was killed when she grabbed hold of a sail and was dragged high into the air and fell. The exhibition committee is hoping to incorporate as many old photographs and pieces of machinery as possible. The display, to be held at St. Mary’s Church on May 29 and 30 and June 1, will be surrounded by a huge flower display. “The bell tower will be open and people will be shown the bells,” said the village curate, the Rev. Christopher Wray, who added that the show would be a prelude to an appeal for cash to preserve the bells. Lovely to see that old wall with a view of the three Kenninghall mills over it. I think that wall was probably the front wall of the field at the front of my grandfather's farm, Grange Farm, Kenninghall - owned in the 50s by Tom Womack and later his son Geoffrey. It was demolished some time in the last 30 years and only ran half way down the field but I could probably draw its profile from memory, having run my fingers along it so many times walking from the village to the farm when we went to visit on the bus on Saturdays. It looked enormous to me in the 1950s! The other side of the wall is still there, running along East Church Street and along my uncle Brian Womack's old house and now, since August, new house too! Henry and Horace Harry Burroughes appear in the 1881 Hoveton_St._John census. Henry was the brother of my wife's Great Grandfather Daniel Burroughes, as was Barnabus Burroughes of Aslacton_Windmill. They were sons of Thomas Burroughes of Kenninghall Post Mill. The son of Barnabus Burroughes went on to sire the owners of Burroughes of Bressingham which went bankrupt a few years ago. One of the family is still alive. The post mill's foundations here are a garden feature; it appears to have pergolas on top of the pier footings. Under the will of John Farrow, son Edmund Farrow becomes owner of windmill, land etc. Under the will of Edmund Farrow dated 21st September 1828, son William Farrow becomes owner of windmill, land etc. Census 1841: James Reeve (25) miller. John Baker (30) miller, not born Nfk.